384 Bristol, 336 Zanussi, 290 Phobos, 240 Ariel(I), with 20 changes of method. Last updated Friday, 8 February 2019 at 08:14:50. First submitted Thursday, 7 February 2019 at 20:32:47 by James C Marchbank. 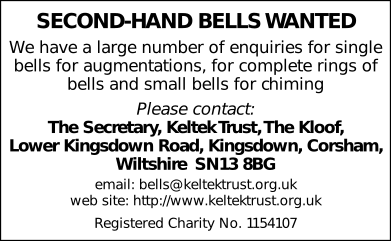 Sent for publication in The Ringing World on Friday, 8 February 2019 at 08:15:16, and printed in one of issues 5627 or 5628.